Groundwater Remedial System Optimization and O&M - Noreas Inc.
NOREAS performed semi-annual groundwater monitoring, remedial system operation & maintenance (O&M), and reporting for a fuel hydrocarbon groundwater plume at Site 2459 at the Marine Corps Base, Camp Pendleton, California. The remediation system had previously been installed and operated for some time. NOREAS reviewed the data and discovered a discrepancy in the previous data which had indicated that the system was not effective. NOREAS performed respiration testing to confirm that biological reduction was taking place and performed additional assessment to delineate the groundwater plume. The system was retrofitted and operated as a bio-venting and air-sparge system. 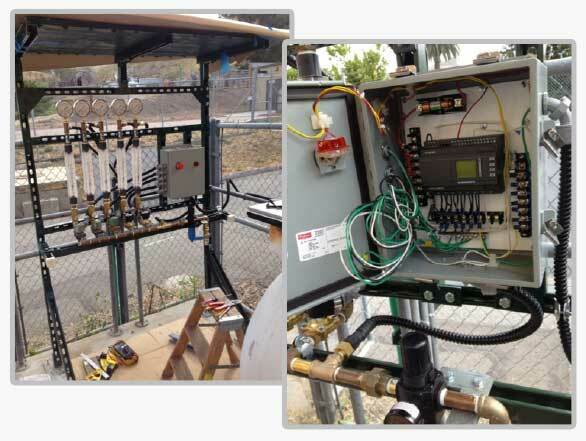 Finally, NOREAS performed continuing O&M of the ongoing air sparge and bio-venting remediation systems. During this period, costly testing was reduced and the system was upgraded and optimized for increased performance, reduced downtime, and for maximizing air/oxygen flow into the subsurface. Results of biosparge system progress were included in the groundwater monitoring reports prepared for the site after each monitoring event.